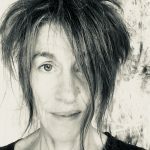 Basia Irland: In 1973, when my son Derek was three, I took his magnetized letters off the fridge and floated them in the nearby stream, spelling out “FLOW” and “FLOWING,” and made these into collaged poems, not realizing then that I would devote my life to water issues. For many years I taught at the University of Waterloo, Ontario, Canada and then in 1985 I was invited to head the sculpture program at the University of New Mexico. For a decade I taught the requisite lab courses, but during the summers I would teach outdoor site-based classes up in the mountains, where we would camp near the Río Grande. Slowly, I was able to let go of the traditional sculpture classes and focus on classes such as Art and Social Activism, which was exactly the kind of course I had been wanting to teach – something that the students could sink their teeth into. One of the joys, for me, of teaching at a university is the proximity of so many disciplines. The Biology Building was right next door to the Art Building, so it was easy to pop over there for conversations. When I left UNM, my primary colleagues were not within the art department, but scattered across campus in numerous diverse departments. I would have no desire to teach at an art school, because then you would only have other artists as your comrades. 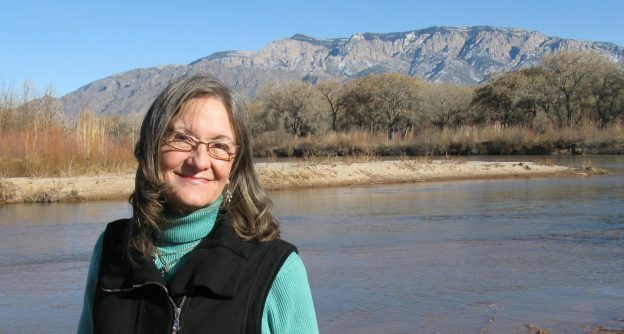 I also team-taught in the Native American Studies Program, and a class with a hydrologist and city planner in Water Resource Management entitled “The Culture of Water.” “International Water Issues” was taught within the University Honors Program. 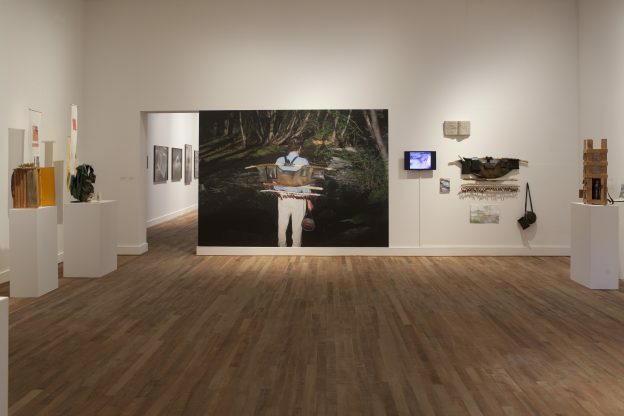 But most importantly, for five years I worked hard to establish the Art and Ecology Program within the Department of Art and Art History, and currently that program is going strong. My intent was that our program would be trans-disciplinary with faculty from across the campus teaching courses. I outlined classes to be taught with biologists, botanists, hydrologists and border water lawyers. Travel to water locations has definitely informed and influenced my work throughout my entire career. In Rio de Janeiro, Brazil, I constructed a sculpture in tribute to Yemanjá, the Mother of the Fishes and Deity of the Sea. Poem for Yemanjá, was a series of seven wooden shelves filled with containers of water collected by collaborators around the world. I was creating a new geography where a river in Africa rests next to the Mississippi; Peru shares a border with Canada; and a holy well in Ireland is positioned alongside another from India. Later, worried that I had essentially “killed” the water through containment, I began the process of returning all the water back to nature by having colleagues and friends pour the contents of each container into some body of water, thereby completing a cycle, but destroying the physical art work. In 1992, I received an Artist in Residence Award, administered by Parsons School of Design, to produce an exhibition in Altos de Chavon, the Dominican Republic. After my first lecture, which was simultaneously translated into Spanish, a biologist in the audience invited me to visit Lago Enriquillo near the Haitian border. This saline lake is home to, and is the breeding grounds for saltwater crocodiles, but they are no longer protected, so hunters have decimated a once-thriving reptile population. This visit to the lake became the primary focus of all the work created while in the Dominican Republic. The installation, Lamentation Poem for the Crocodiles of Lago Enriquillo (Poema-lamentación por los cocodrilos del Lagos Enriquillo), consisted of crocodile cranium bone fragments found at the lake, which were placed on piles of salt under light bulbs. A carved wooden book was coated with small shells from the site, and charcoal from the crocodile hunter’s fires became the text. 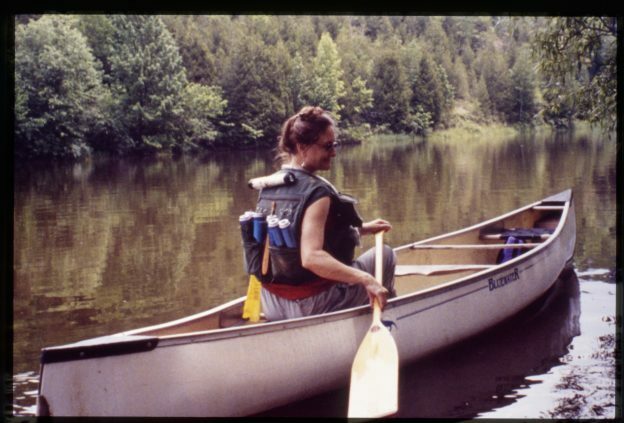 Another residency that was very productive took place in the Laurentian Mountains of Quebec, Canada on Lac Jumeau, where I created Kit for Paddling Through Stars Floating on a Lake in 2000. I would paddle a canoe on a lake through the mist each morning at dawn, so I carved my own paddles out of lime wood (linden wood), added star maps to the surface, and created a kit to hold them. I used the paddles at night to ferry guests in a canoe out to a floating platform lined with candles, so they could sit quietly in a chair I had topped with a willow-branch dome. I was awarded a Fulbright Senior Research Award for Southeast Asia in 1994 in order to conduct research in Bali, Indonesia. In a forest full of monkeys, during the six months in Bali, I worked with a group of carvers in order to create a series of sculptures, including Holy Water (for Ganesh). Bali is home to the island religion of Holy Water, or Agama Tirtha. Ubiquitous blessings of holy water are sprinkled on everything from motorcycles to chickens to the feet of Hindu Priests during a ceremony. In December 2004, I was invited by Dr. Sara Ahmed to give two lectures in India. One talk, Excavating Water; Transforming the Environment through Art was presented at the Centre for Environment and Technology in Ahmedabad and the other lecture on Waterborne Diseases was in Jaipur at the Institute for Development Studies. After my talk in Ahmedabad, Jhalak Bhavsar, a reporter from the Times of India, interviewed me. Her article was entitled, Speaking an Ecological Language. During discussions, I learned that Jhalak’s father had worked for years on the controversial Sardar Sarovar Dam, where the famed writer, Arundati Roy was arrested while protesting the construction of this dam, which displaced thousands of families, similar to what happened at the Three Gorges Dam in China. This dam blocks the flow of the sacred Narmada River. Jalak asked if I would like to visit the dam, which at that time was off limits to the public, so we had an incredible time seeing the dam structure up close and even staying in the dorms where the construction workers live. In 2008, Dr. Eric Sam Loker, Chair of the Biology Department and I received a Large Interdisciplinary Research Allocation Committee Grant from the University of New Mexico to produce a video documentary about Schistosomiasis in Egypt, Nepal, and Ethiopia. In Nepal we filmed elephants who were infected with this deadly waterborne disease. I worked with two parisitologists, Dr. Prem Budha and Dr. Ramesh Devkota in southern Nepal along the Rapti River. We gathered elephant dung and studied it under the microscope to investigate the squirming schistosomes. I filmed and produced the video documentary Bilharzia Blues: An Integrated Artistic/Biological Approach to Schistosomiasis in Egypt, Ethiopia and Nepal. This film provides a lively and informative look at the terrible beauty of schisto, also known as Bilharzia, which I had been investigating for two decades. I also worked with local musicians who composed and played new songs, accompanied by traditional instruments, about how to avoid contracting bilharzia, which are sung in Arabic, Nubian, Nepalese, and Amharic. In Cairo I created several Schistosomiasis scrolls using Egyptian cotton purchased at the ancient El Khan Khalili bazaar — and from a spice merchant I bought “paints” of indigo, saffron root, and henna. Most people are aware of the White Nile, but the Blue Nile, which has its headwaters in Ethiopia, provides much of the water downstream in the important Delta region. It was an epic experience to reach the source of the Blue Nile at Lake Tana near Bahir Dar, Ethiopia. Even though the lake is highly infected with Schistosomiasis, men paddling woven papyrus reed boats as they sat half submerged in the water, plied their way back and forth across the surface, while villagers washed their clothes near the shore. Being in countries where water was scarce, and often highly polluted, I witnessed women having to carry water on their heads for their family’s daily use. Women are the carriers of water around the world, and they have to walk many miles each day to obtain a minimum amount of water. In the western world, we take water for granted. We turn on the tap in the kitchen to wash dishes. We get into the shower and let the flow wash clean our skin and hair. We put the sprinkler system on to keep our lawns green and our golf courses fresh. But how many of us ever question where this water comes from and how much is left for the rapidly increasing population? Last year, I had a large retrospective at the Museum De Domijnen in the Netherlands, where all of the work focused on various aspects of water. For brevity within this interview, I will only mention two pieces. Contemplation Stations were a set of seven sculptural wooden chairs covered with canopies of river reeds that were placed beside local streams, so that participants could sit inside, and be witness to the river. To sit in repose by yourself and view the current has the ability to quiet the mind, relax the body, and feed the soul. Below was a projection of flowing water onto the three huge windows on the façade of the museum: The Netherlands are below sea level and with climate change, someday this museum just might be underwater. I have also been fortunate to raise funds to build much-needed wells for drinking water in numerous countries through the sale of my art. One fundraiser, held at a local cinema, in which I showed all of my water documentaries, raised money for Water For People. And part of the proceeds from the sale of my first book, Water Library, goes toward W.A.S.H., launched as an international campaign by the Water and Sanitation Collaborative Council and mandated by the United Nations to provide safe domestic Water, And Sanitation Hygiene for all. 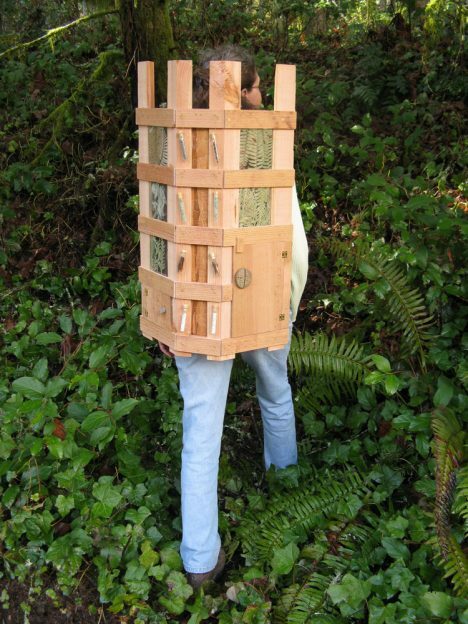 RB: Have there been any particular influences on your art practice? BI: The greatest influence on my practice as an artist has always been water itself. Hanging out with rivers around the world has been my greatest teacher. I am a humble student constantly learning from tiny rivulets, dammed and damned streams, Wild and Scenic river systems, or major waterways. Writers and poets have influenced my work more than other visual artists. My Masters Thesis from the University of Massachusetts included a bibliography of twenty-five books but did not list a single art book. Instead, there were volumes on cosmology, galaxies, symbolism, and anthologies of concrete poetry. Loren Eiseley, scientist, anthropologist, and poet, endeared himself to me by writing; “If there is magic on the planet it is contained in water.” The four books of his in my library to which I often return are: The Star Thrower, The Unexpected Universe, Notes of an Alchemist, and The Immense Journey: An Imaginative Naturalist Explores the Mysteries of Man and Nature. Eiseley writes with such wonder and awe about the ordinary every-day. His essay, The Star Thrower, evokes empathy for all beings and tells the story of a time when Eiseley was at the beach and feeling distain for tourists who were picking up live creatures from the shore to take home as souvenirs. However, there was one man, whom upon finding starfish stranded on shore as the tide receded, began to throw them back into the water. There were so many that when asked why he bothered, the man replied that it definitely mattered to that one starfish and its family. BI: Water inspires me because it is necessary for all life. We simply cannot survive without it. Water has always fed my soul: floating weightless in a natural lake, face up, looking at the clouds; sitting on a rock beside an ever-changing mountain stream, listening; hiking to the source of a river; wading barefoot in a cold creek. Absorbing water’s presence, especially in wild regions, prepares me to come back to the city and carry on with my urban tasks. Memories from my personal “library of the senses” go hand in hand with the academic research for every water project I create. We are water. Our bodies house streams: lymph, bile, sweat, blood, mucus, urine. Water enters, circulates, leaves – individualized hydrologic cycles. Each of us is a walking ocean, sloshing down the hallway with damp saline innards held together by a paper-thin epidermis. We are all connected through the continuous water cycle. I think of rivers as being alive and was therefore grateful when the Maori in New Zealand won a court case in March 2017 that granted the Whanganui River legal personhood. This relationship is called Te Awa Tupua, which means that the river and the people are part of an integrated whole. Because I live in New Mexico, my external watershed is the Río Grande, but my internal watershed includes urine. I flush my pee down the toilet, which goes to the sewage treatment plant, which flows into the river, which then, again, provides drinking water. Water embodies complexity. Whether in its gaseous, frozen, or fluid state it is marvellously mysterious. A quiet stream can provide a serene contemplative setting, and yet that very same creek can flood and wipe out an entire village. The wrath of water that was witnessed in the Indonesian and Japanese tsunamis is almost incomprehensible. We cannot survive without clean water to drink and yet it is often polluted beyond measure, with toxins, medical waste, and waterborne diseases clogging the arteries upon which we rely for our very existence. BI: As an artist, one can never be certain what your audience is receiving from your work. It is like the proverbial drop of water falling into a lake. One cannot discern how many of the outward ripples find their way to an interested or inquisitive mind. My passion is to distil relevant information into works of art with the hope that this distillation might lead, on some small scale, to a broader appreciation for the importance of water in our everyday lives. And therefore, might also lead to compassionate actions on behalf of waters around the world. RB: The theme of this Interalia Magazine issue explores the interconnectedness of water. How does this resonate with your own work? 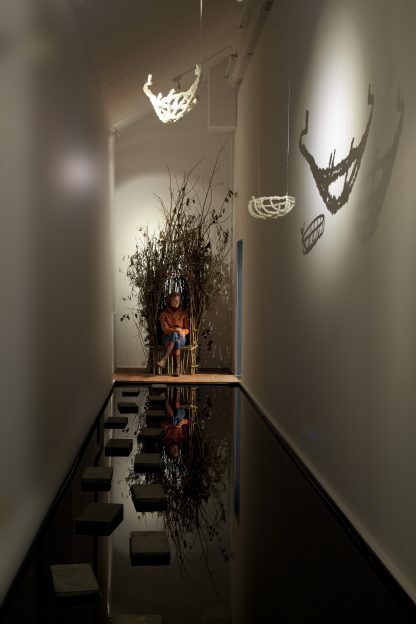 BI: The idea of interconnectedness has been one of the central themes of my water work for over forty years. Water issues are vast and present intricately complex problems. I think that the solutions and suggestions for actions lie in a diversity of approaches. It will take all of us working together cooperatively to come to the assistance of bodies of water around the globe. In this radically interconnected world it behooves each of us to compassionately take care of each other and our environment, because we are one and the same. The hydrologic cycle is one example of these connections. Clouds gather overhead, conferring about how soon to release their moisture. Slow, steady rain builds to a crescendo. Winds blow. Temperatures drop. Snow accumulates. Months pass, and the frozen elements melt, trickling toward a river, flowing out to sea, eventually evaporating to re-form the cloud committee, and the hydrologic cycle continues its primeval rhythms, as it has for eons. The same water the dinosaurs drank circulates in our bodies. The artist’s wet breath mixes with moisture exhaled by aspen trees, river otters, blue herons, and my dog. The total water supply that existed three billion years ago remains relatively constant, recycled over and over through evaporation, condensation, and precipitation. RB: Drought plays a central role in your work. Can you say something more about this? BI: I live in New Mexico in the southwest region of the United States and we have experienced ever-increasing periods of extended drought. 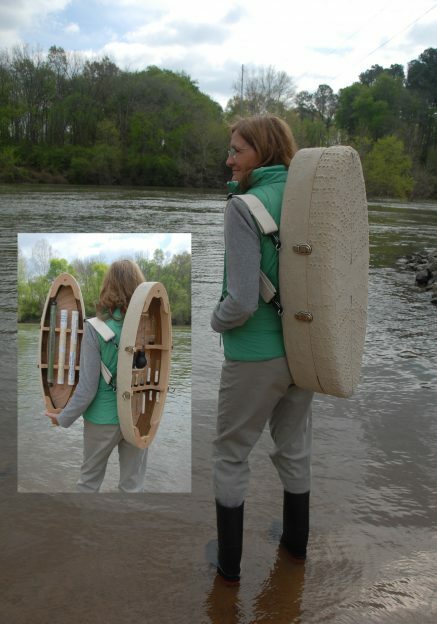 Naturally, this effects our local rivers. This year, 2018, there was very little snow-pack in the mountains and we have had almost no rain, so our rivers are running low, especially the Río Grande, which flows (when it is able to) right through Albuquerque, my home town. I have constructed several rain-water harvesting projects. Storing and utilizing moisture that has fallen from the sky is an ancient tradition that is gaining renewed respect during this century in various locations around the globe. Harvested precipitation can be used for humans, animals, and plants. Any household can collect water simply by placing a large container underneath a gutter downspout. As the global water crisis continues to worsen, if every new building were designed to redirect runoff toward gardens, and existing structures were retrofitted with simple rain catchment systems, we could conserve a lot of moisture. Basia Irland sitting within Station II while viewing the River Maas, The Netherlands. Sponsored by Museum de Domijnen. RB: Many of your projects happen within the context of a local community, working closely with them. What effect does this have on your creative and working process? 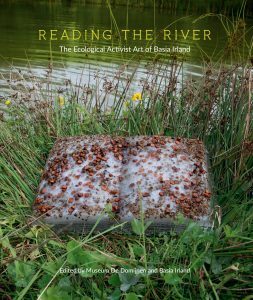 BI: Working closely with local communities is a huge joy for me, and an integral part of most of my projects, especially Ice Receding/Books Reseeding and the Gathering of Waters. I often work with scientists, but my vision, language and approach is as an artist. Water meanders in and out of every discipline, so I collaborate with local poets, hydrologists, tribal leaders, urban planners, biologists, philosophers, lawyers, farmers, writers, NGO’s, geologists, and citizens working to amplify and aid water’s voice. Working within community is not easy, but always worth the effort. Often when I am invited to create a project, there is a certain expectation that I will know ahead of time what the outcome will be, but first I visit the river, get to know the community members, and then begin to formulate how best to approach particular local problems with their assistance and feedback. RB: Can you say something about your Ice Books: Ice Receding/Books Reseeding? BI: Ice Receding/Books Reseeding emphasizes the necessity of communal effort, scientific knowledge, and poetic intervention to deal with the complex issues of climate disruption and watershed restoration through the release of seed-laden ephemeral ice sculptures into rivers, creeks, and streams. This project presents a lyrical way to promote positive actions that may have constructive results in helping restore streams anywhere in the world, and provides a model that can be replicated. 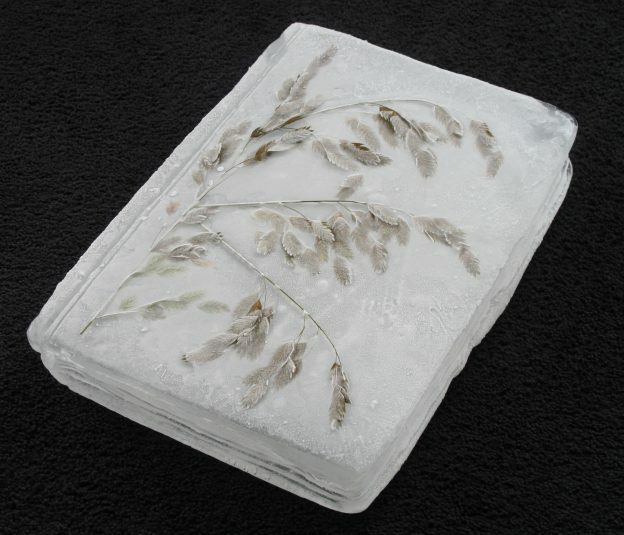 River water is frozen, carved into the form of a book, embedded with riparian seeds, and placed back into the stream. The site-specific seeds are released as the ice melts in the current. These seeds transcribe a global environmental composition. Since it is not a specific language — neither Japanese nor Thai, Italian nor Yaqui — the seed script embedded within each ice sculpture can be read as a language of the earth. The title of this series of projects was originally conceived for Weather Report, a ground-breaking exhibition and catalogue about climate change curated by author and cultural critic, Lucy Lippard, for the Museum of Contemporary Art, Boulder, Colorado. 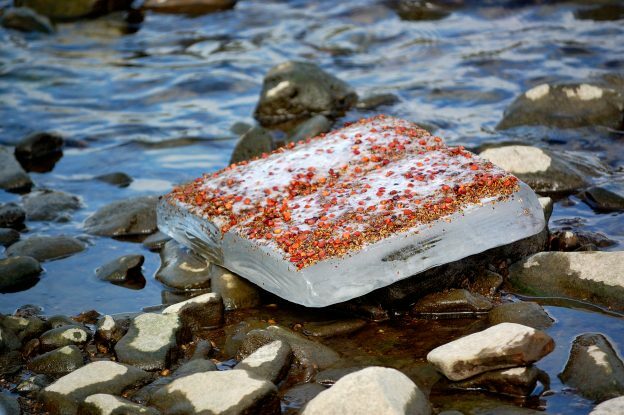 In order to call attention to melting glaciers and embed an action within the sculpture, I carved a 250-pound tome from ice and engraved it with a seed composition of mountain maple (Acer spicatum), columbine flowers (Aquilegia coerulea), and Colorado blue spruce (Picea pungens). 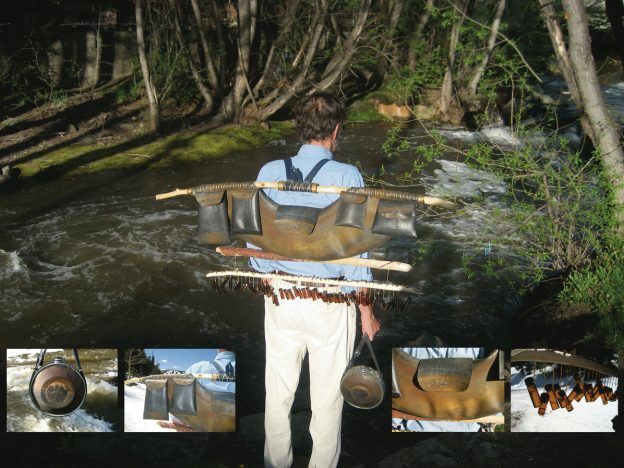 Six people carried the heavy book out into the current of Boulder Creek. As it rested between two large rocks, viewers could see the water flowing under the ice. One of the photographs of this piece shows three students standing in the river as they ‘read’ the seed writing on the book. Arapaho Glacier, which provides a large percentage of Boulder’s drinking water, is receding rapidly due to climate disruption. When it is gone, from where will Boulder residents, both human and non, obtain water? These sculptures depict a problem — receding glaciers — and a suggestion for action – reseeding riparian zones to reduce some of the effects of climate change through plants. Plants sequester carbon, mitigate floods and drought, pollinate other plants, disperse seeds, create soil regeneration and preservation, act as filters for pollutants and debris, supply leaf-litter (for food and habitat), promote aesthetic pleasure, hold the banks in place (to slow erosion), and provide shelter/shade for riverside organisms including humans. Stream ecologists, river restoration biologists, and botanists help to ascertain the best seeds for each specific riparian zone. The seeds form a language of the river, a restoration text. 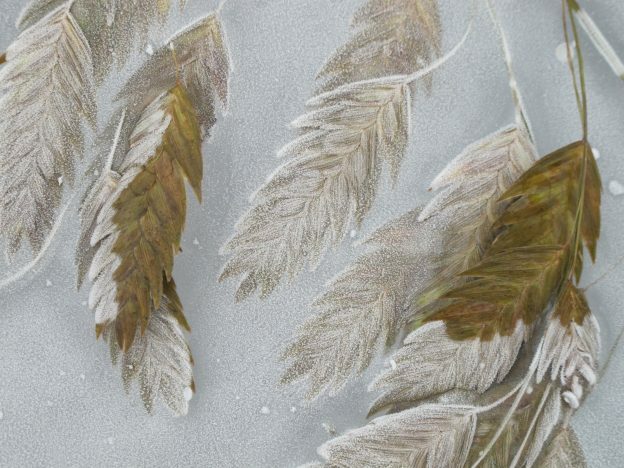 The calligraphic sentences of seeds slide from the melting pages of the translucent volumes into the water to be carried to shore on many international rivers where I have been invited to work with the local community in producing the ice books. RB: You have written a series of essays for National Geographic about seeing from the perspective of a river. Can you say more about this? BI: It is indeed a privilege to be a writer transcribing the stories of our rivers’ moist stories. It has opened my eyes and my heart to the depth of knowledge a river accumulates over thousands of years as it traverses the land. I only write about rivers that I know, and love. The experiential is important — yet so is all the intense research that goes into the writing of each essay. I also consult closely with experts who know the river. Recently, while visiting Yosemite National Park in California, and writing about the Merced River, I met with three park rangers who have lived in the region for many years and know this river well. One of them is of Ahwahneechee decent, and because I was writing a lot about the tribal history of the region in relation to the river, it was extremely helpful to get his feedback on the manuscript. 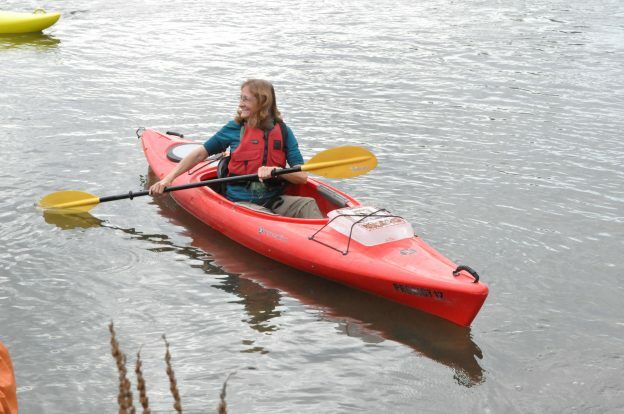 And last month, while formulating the essay about the San Lorenzo River in Santa Cruz, California, the Director of the Coastal Watershed Council offered feedback about certain species that are found in the tidal waters of the estuary. Whenever possible I write about the tribal history in relation to a river. In Mexico, for example, an indigenous Yaqui friend and I talked with a family who were washing their clothes in the filthy, pesticide-ridden muck of the Yaqui River. There was no other place to get water, even though it was overly polluted with runoff from big-business agricultural fields upstream. Also, eight Yaqui villages do not have any access to drinking water, and now must purchase it in containers at a price that most families cannot afford. The basic human right to fresh water has been commercialized in poor countries around the globe. 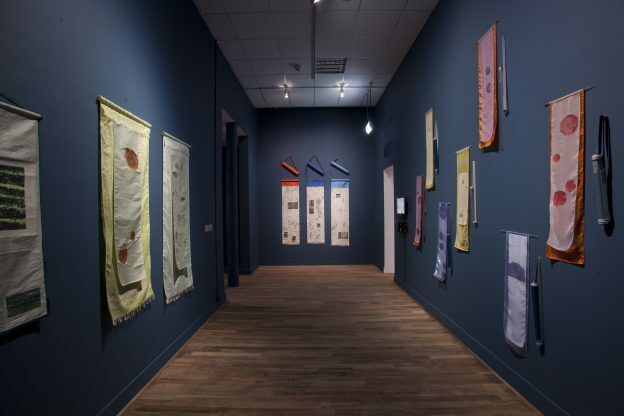 Basia Irland, Museum De Domijnen, Sittard, the Netherlands, 2015. BI: I am continuing to write more essays about international rivers. Last month I was in Amsterdam, Paris, and London, which gave me the opportunity to write about the Amstel River, the Seine, and the Thames. I also continue to receive invitations to lecture and will give a keynote address at the Nantang Technological University during a sustainability conference in October. Immediately afterward I fly to Wuhan, China to present a talk at the Great Rivers Forum, which is sponsored by UNESCO. 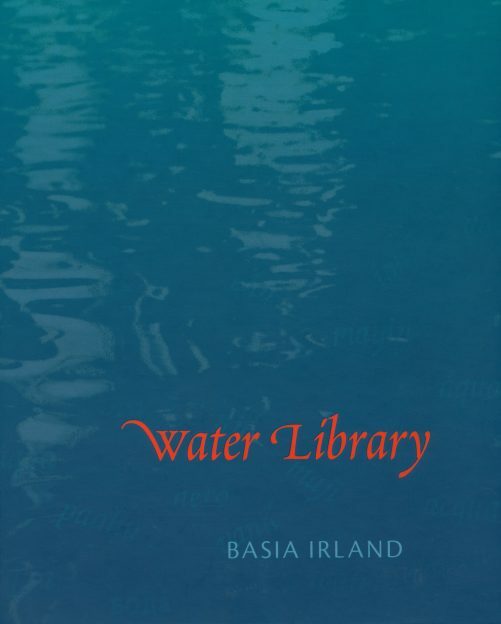 This extensive publication encompasses over 30 years of Basia Irland’s work and includes essays by ecologists, art historians and notable curators such as Lucy Lippard and Amanda Boetzkes.